All Aikido techniques begin and end with the principle of non-dissension. We must be able to remain peaceful in our daily lives and in all situations. Shinshin Toistu Aikido teaches non-dissension by eliminating the idea of a conflict in our hearts as well as in the hearts of others. "The absolute universe is One. Then two opposing forces appeared, and the relative world was born. "In the Orient this dualism is called yin and yang, in the West plus and minus. A bright and happy life is called plus life, and a dark, gloomy one is called minus. "Let us eliminate every minus thought and strive for plus life henceforth." To realize the (original) unity of mind and body (bodymind). Seika no iten ni kokoro o shizumei toitsu suru. Zenshin no chikara o kanzen ni nuku. the entire body/mind and emotion. 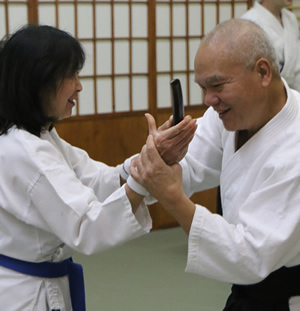 The Ki Society International was established in 1971 by Koichi Tohei, 10th dan in Aikido. Tohei Sensei was awarded this highest rank directly by Aikido Founder Morihei Ueshiba, O Sensei. 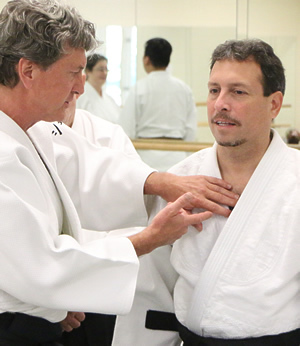 The purpose of the Ki Society is to teach the principles of Ki which are based on Aikido arts and which show the way to coordinate and unify mind and body. People practicing Aikido can benefit greatly from the teachings of the Ki Society. If we perform the arts of Aikido with only physical strength, our power is limited, and we will not be able to throw a bigger or stronger opponent. But, if we master the principles of Ki, we will have the strength of mind and body unified and be able to throw even big men easily. Also, while the techniques of Aikido must not be used except in an extreme emergency, the teachings of Ki Society can be applied in our everyday life. The Ki Society teaches not "how to say" but "how to do." On the lower level, behind the building.